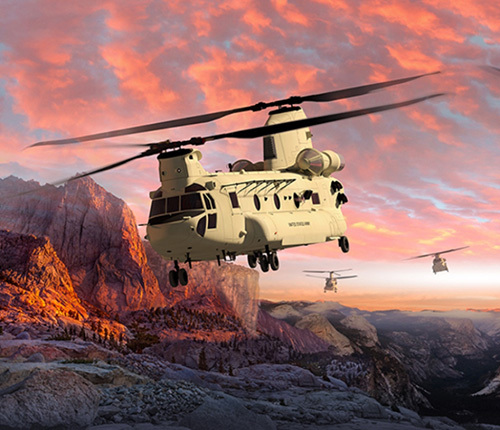 Boeing will build and test three U.S. Army CH-47F Block II Chinook helicopters as part of a modernization effort that will likely bring another two decades of work to the company's Philadelphia site. “The Army’s only heavy-lift helicopter exists to deliver decisive combat power for our ground commanders. The Cargo family is anxious to build upon Col. Rob Barrie's efforts to establish this critical program and deliver an adaptive air vehicle. Increasing payload capacity today enhances battlefield agility and prepares the Chinook for even greater performance gains in the future,” said Colonel Greg Fortier, U.S. Army Project Manager for Cargo Helicopters. An improved drivetrain will transfer greater power from the engines to the all-new, swept-tip Advanced Chinook Rotor Blades, which have been engineered to lift 1,500 additional pounds on their own. The current configuration of six fuel tanks – three on each side - will become two, allowing the aircraft to carry more fuel and shed weight. Additionally, the fuselage’s structure will be strengthened in critical areas to allow the aircraft to carry additional payload. “This latest upgrade for the Chinook fleet is a tribute to the robustness of its original design and exemplifies its 55-year legacy of technological advancements. The fact that the U.S. Army continues to use and value this platform and they are intending to continue to upgrade it to keep it flying for decades to come is a testament of the capabilities the Chinook team continues to bring,” said Chuck Dabundo, Vice President, Cargo Helicopters and Program Manager, H-47. Boeing will begin building the test aircraft next year. The test program begins in 2019 and first delivery of the Block II Chinook is expected in 2023. Eventually, the Army will upgrade more than 500 Chinooks to Block II configuration.